Nicknamed the “Mile High City,” Denver, Colorado lies at the foot of the Rocky Mountains, giving the town a unique topography and climate. Combined with the city’s inviting business atmosphere and wealth of quality schools, this environment has attracted countless entrepreneurs, administrators, and skilled professionals from across the country, along with a number of vibrant businesses. ExpeditedFreight.com lets these businesses take full advantage of the city’s opportunities for success. By shipping in supplies and sending out finished products over any distance, we help Denver’s innovative producers thrive. 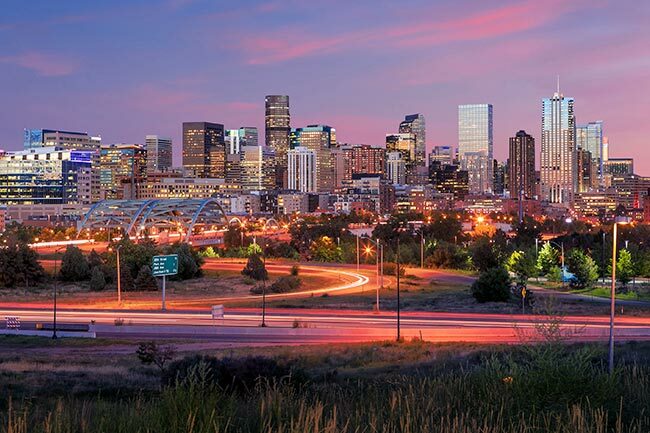 Denver anchors a metropolitan area with nearly 3 million people, as well as the businesses and government services to employ and supply them. As in any metropolis this large, local businesses struggle to bring in supplies swiftly and safely while sharing the roads with commuters. But this is even more difficult in Denver given the city’s alpine location, which makes it harder for ground carriers to get in and out on time without taking unacceptable risks. This is a particularly serious problem for manufacturers in the area, such as the budding automotive industry. Such producers need to bring in supplies from distant locations on tight schedules, and cannot afford to have those supplies damaged. They thus expect the highest standards of service from the carriers they work with. ExpeditedFreight.com has consistently met and exceeded these high carrier standards. With more than a decade of experience working as an expedited freight company, we have developed a comprehensive express trucking strategy. This allows us to serve Denver proper along with all its neighboring communities, including Colorado Springs, Loveland, Boulder, Centennial, Lakewood and Aurora. ExpeditedFreight.com relies on team driving, meaning we devote two drivers to every vehicle that has to cross more than a minimum distance. This way, even if we have to keep the truck on the road all night, each driver will have a chance to rest while the other drives, ensuring they can do their job safely. We further enhance safety through dedicated trucking, which involves reserving a vehicle just for your goods. This gives us the freedom to load specialized equipment that can preserve your goods en route. Besides safety, ExpeditedFreight.com maximizes speed. We do this by planning every journey ahead of time, identifying the shortest route that does not expose us to traffic jams, harsh weather, or other contingencies. To make sure everything goes according to this plan, we track each truck, looking out for obstacles along the way. Whenever an obstacle arises, we adjust the plan and communicate the adjustment to our drivers, keeping your order on track. We have a vast coverage network, with personnel and vehicles in all major American and Canadian metropolises who can begin shipping into Denver at a moment’s notice. Combined with our 24/7 customer support team, this lets us offer you quality logistics whenever you need it. For more information or to request a free quote, visit ExpeditedFreight.com or give us a call at (720) 262-8998.